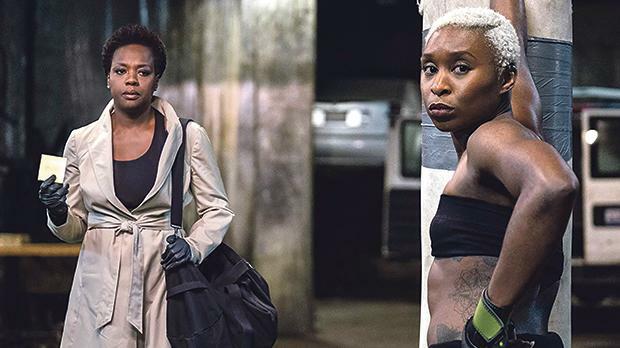 Viola Davis (left) and Cynthia Erivo pull their only and last heist in Widows. Widows is the first offering from Steve McQueen since his history-making, academy award-winner 12 Years a Slave. While surely not a studio regurgitated cash-grab, Widows still poses as a departure from McQueen’s usual fare, both thematically as well as technically. It moves away from the Turner prize winning director’s tendency to favour long contemplative dramas, this time presenting a quick cut action thriller that carries a deeper allegory, with a nonetheless hefty run time, clocking in at over two hours. The film takes its cues from an ITV crime-drama of the same name, which aired in 1983 and was penned by screen writer and author Lynda la Plante. This iteration sees life breathed into it by Gillian Flynn, author and screen writer of Gone Girl and this year’s fantastic Sharp Objects. Throwing you straight into the action, we begin mise en scène, as a heist goes terribly wrong, leaving its four executors, played by Liam Neeson, Jon Bernthal, Manuel Garcia-Rulfo and Garret Dillahunt, dead. The aftermath suddenly exposes their criminal lives and leaves their widows, Veronica (Viola Davis), Linda (Michelle Williams), Alice (Elizabeth Debicki) and Belle (Cynthia Erivo), vulnerable and at risk from their enemies. Now under threat from crime boss Jamal Manning (Brian Tyree Henry) along with his brother and enforcer Jatemme (a chilling performance from Get Out’s Daniel Kaluuya), the widows must band together to ensure their survival. Hatching a bold and daring plan, Veronica, on finding her late husband’s criminal plans, strings together a plot to keep them out of their enemies’ reach. Roping in politician Jack Mulligan (Colin Farrel), through some scrupulous blackmail, to their cause, these women with nothing to lose must rise to a mountainous challenge in order to survive, pull off the heist that their husbands could not. Widows has received largely positive reviews, with many giving top marks to its stellar cast and its expert blending of popcorn entertainment with serious themes, making poignant comments on issues such as race, gender and social class. Dowd hails the performances “first rate” and calls the plot a “Michael Mann crime opus with a socio-political dimension” in which women must “exploit how the world underestimates them to outfox the powerful, abusive men in their way.” His final verdict is that the film is “a proudly mainstream movie – a fun one, even – that just happens to have been made with conviction and intelligence and craft”. David Edelstein of Vulture, who says McQueen’s earlier work is “reliably punishing”, nevertheless calls Widows “the movie that Oceans Eight should have been”, calling it a “stark, violent, cynical but thoroughly entertaining caper picture”. Edelstein heaps praise upon the four female leads in Davis, Rodriguez, Debicki and Erivo, citing an opportunity for Davis and Rodriguez to break rank from their usual stock of characters, which they manage formidably. Of Daniel Kaluuya, Edelstein professes a strong performance, calling the character of Jatemme Manning “a villain that’s worthy of him”. “Viola Davis’s contemptuous stare has the force of a double-barrelled shotgun,” writes Peter Bradshaw of The Guardian.